To encourage and promote lifelong connections with Arizona teammates, coaches, and staff, while upholding the tradition and heritage of Arizona Athletics and building pride in the “A” that only letterwinners understand. Chrissy Alexander joined the A-Club and Wildcat Club in January 2019 as the Assistant Athletics Director for Alumni Letterwinners and Development. Her responsibilities include day to day oversight of the A-Club Letterwinners Association and all alumni outreach as well as securing gifts for the Wildcat Club. Prior to joining the Wildcat Club, Chrissy worked for IMG College, most recently as a Senior Account Executive working to increase sponsorship exposure and revenue for Arizona Athletics. An Arizona Softball letterwinner from 1996-2000 Chrissy won two Pac-10 Championships and was a part of the 1997 NCAA National Championship Team. She was named both the Raytheon Sport Woman of the Year and the City of Tucson Hispanic Sports & Academic Enrichment Player of the Year in 1999. Chrissy and her husband Zach (UA Alum, 2001) have three children, Simone, Shane and Scarlett. James “Jimmy” Gehrels was born and raised in Tucson, Arizona and joined the Wildcat Club and A-Club in May of 2018. 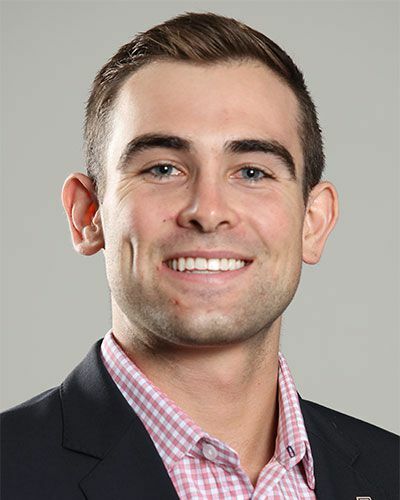 In his role as Assistant Director of Alumni Letterwinners Jimmy works closely with all former letterwinners, participants and coaches to bring them back to campus and keep them involved in Arizona Athletics through programming and events. Jimmy received his BA in Sport Administration from Pepperdine University where he played four years of NCAA Division I Men’s Volleyball. Prior to Arizona, Jimmy spent almost a year at the University of Florida working with Gator Boosters, Inc. and pursuing his Masters in Sports Management. Am I an active A-Club member? How do I sign up for the A-Club? All letterwinners, managers, honorary letterwinners, and team participants are eligible to sign up for an A-Club membership, just complete the questionnaire on the members page. Do A-Club members receive a discount for game tickets? Active A-Club members receive a 15% discount on their first pair of season tickets (excluding Men’s Basketball and postseason). How do I request game tickets? A limited amount of game tickets are available for purchase through the A-Club, requests must be made a minimum of three weeks prior to the desired contest. Please call the A-Club office at (520)-621-0881 to place your request.